Italy is an amazing peninsula full of incredible locations, still untouched, in full, natural bloom. One of these enchanting places is the archipelago of the ‘Isole Eolie’, located to the north of Sicily. 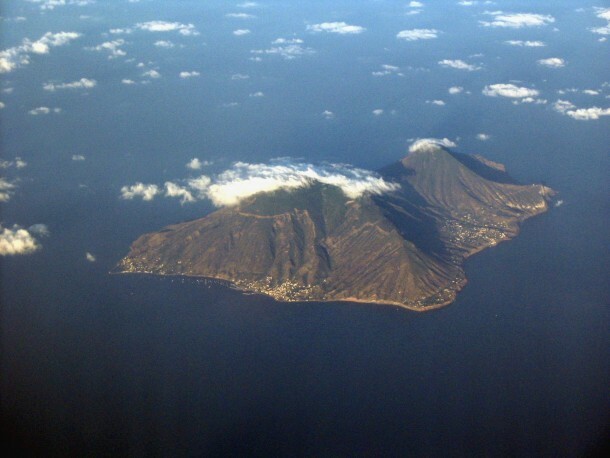 This group of volcanic islands is set in the enchanting frame of Tyrrhenian Sea and is made up of seven main atolls: Alicudi, Filicudi, Salina, Vulcano, Lipari, Panarea and Stromboli. Being of volcanic origin, the soil is very unique, especially in Vulcano, where the beaches are completely carbon black. The reason is that there are two active volcanoes in the area, which also give the name to two of the islands: Stromboli and Vulcano. This distinctive trait attracts thousands of tourists every year. Apart from the natural, volcanic beauty, these islands host the most interesting and tasty products due to their very rich soils. One of the most remarkable delicacies of this area is the Salina Caper, a typical product of the island of Salina. Capers are the delicious fruit of a wild shrub that flowers from May to August on the coasts of this fascinating island. 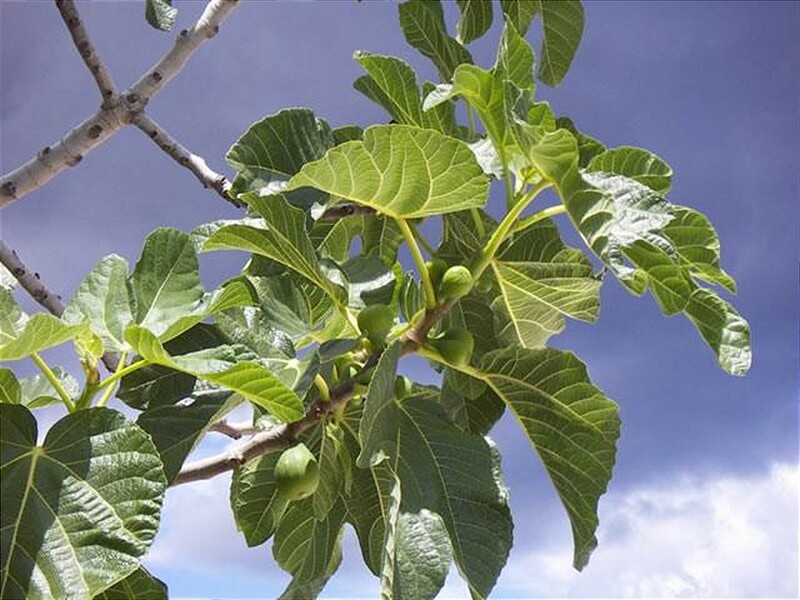 This fruit has been used since ancient times for both medical purposes and for nourishment and it has a particular tangy, floral taste. Salina Capers are handpicked during the flowering months and can be consumed as they are or in salt. Usually the salting process gives the capers a longer shelf life since these flower buds are completely natural and non-processed. Once picked the capers are sun dried on jute cloths and then placed in wooden or hard plastic drums with alternate layers of salt. They are ready to eat after approximately one month and can be used all year long. 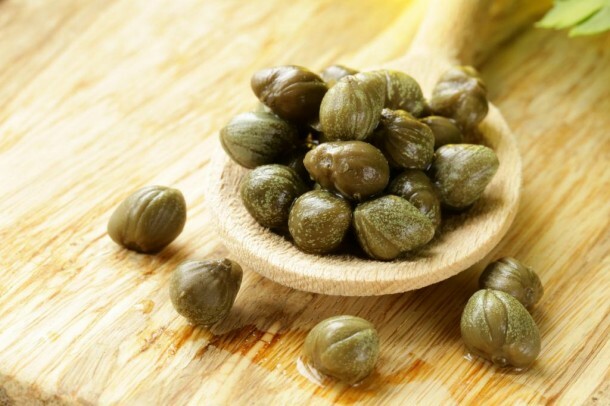 You can generally find capers preserved in olive oil or in salt. If you are using the traditional salted ones they should be rinsed well before you add them, ideally they should retain a little of their salty taste so it’s a good idea to cut down on any added salt in the recipe you are following. If you are cooking capers they should not be over-cooked as will lose their taste and character. Capers preserved in olive oil can be used directly from the jar with their oil and tend to be a little less scarp and acidic. Some of the dishes that get a savoury kick from these salty pearls are: Cod fillet, which is usually cooked with cherry tomatoes, olives and capers; linguine or spaghetti alla puttanesca, long pasta with a sauce enriched with black olives, capers and sometimes anchovies, lemon caper linguine – a really simple dish flavoured with lemon oil and capers, and a tasty caper salad, which is the easiest dish to prepare using these floral treats. 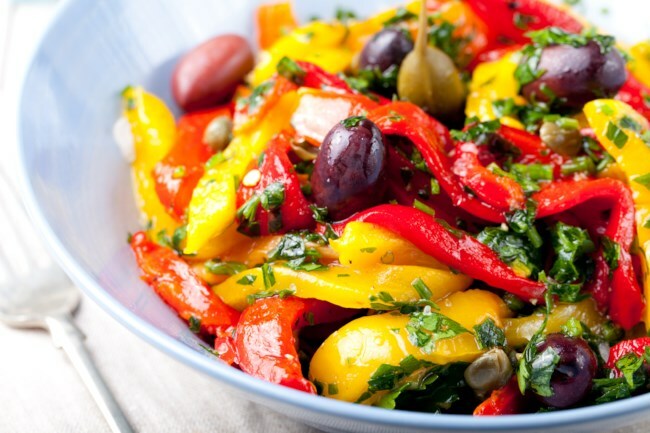 Place the peppers on a lined baking tray and brush them with oil. Grill them for 10-15 minutes turning them until the skins are well charred. Put the peppers in a plastic bag and seal for 5 mins to loosen the skins. Meanwhile, crush the garlic and a generous pinch of salt to a paste using a pestle and mortar. Add the vinegar and oil, and blend to make a dressing. Strip the skins and seeds from the peppers, then cut into pieces. Place in a bowl. Pour over the dressing and scatter with the capers, olives and pine nuts. Serve with a bruschetta drizzled with extra virgin oil. Our Salina capers are a Slow Food product. Find out more about Slow Food Presidia.